Oh wait. Wrong Holiday. It was Thanksgiving Day – 2014. 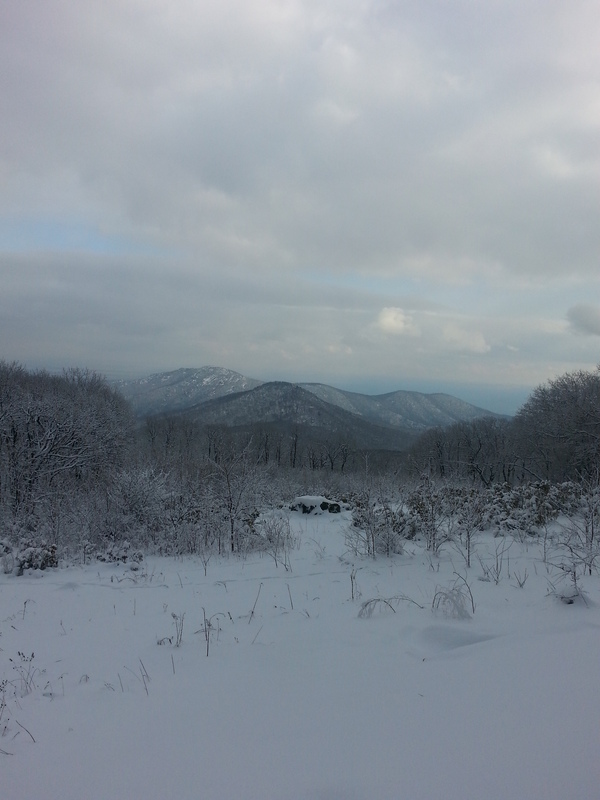 And the snow had fallen the previous day and shut down Skyline Drive…. the only way in to our Thanksgiving Feast at Skyland Resort. As we drove from our home to Shenandoah National Park, we were unsure where we would be eating our Thanksgiving Meal. At 7:00 Am Skyland Drive remained closed. I entered the # on speed dial (thankful for cell phones). We decided we would keep calling and would not give up hope until we hit the entrance gate. As we traveled out of Pennsylvania – a call was made. Road Closed. Through Maryland – Road Closed. I called the lodge and asked for an alternative road or if they could send down some snowmobiles (I was told this was not Yellowstone.) Through West Virginia we travelled – Road Close. Entered Virginia – Road Closed… I instead this time decided to call the restaurant. It was hard to believe there was not some sort of access road to get us to Skyland Resort. We were asked if wanted to cancel… but where else would we eat? No way. We were holding out. With less then one hour to go, leaving the highway and diverting from our final destination… the message had changed. I had to listen again just to believe it.. Road open form Thorton Gap to Skyland Lodge! One way in and one way out. It would mean backtracking to reach our final destination but that did not matter! We were in! Thanksgiving Day was saved! As we entered the lodge, we were seated at the best table – with a view overlooking the snow covered mountain down to the valley below. We enjoyed a feast – what a wonderful meal! A Thanksgiving hike was planned to burn off the calories but that was unfortunately not going to happen… but there were still pullovers to stop enjoy! As we descended the mountain, the snow began to fall again but this did not stop us from stopping at each pullover to enjoy the view. By the last pullover it became one big blur as the snow began to come down steadily. We departed Shenandoah National Park stuffed and oh so happy. It was surely a Thanksgiving that we will never forget!